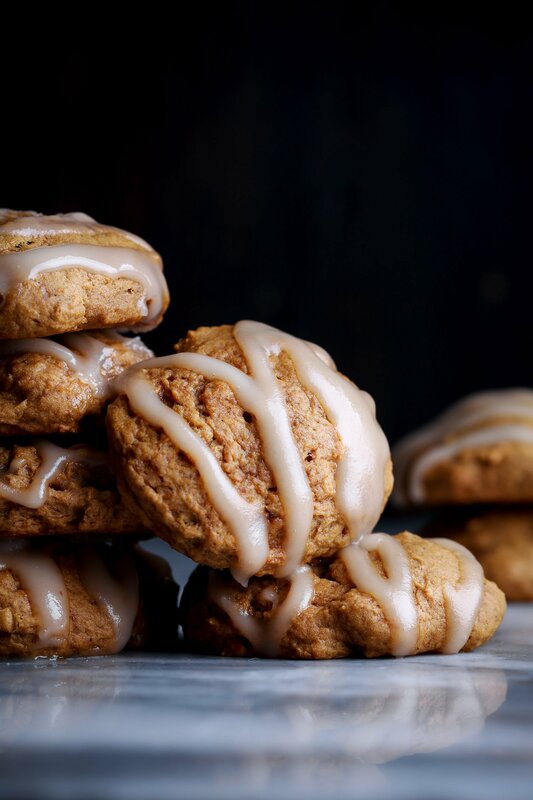 Chai-spiced pumpkin cookies with a maple glaze. These have a very soft, cake-like texture and are super delicious! Dairy, egg, and refined sugar free with gluten-free option, plus vegan friendly. Preheat oven to 350 degrees Fahrenheit. Line a baking sheet with parchment paper or lightly grease with coconut oil/oil of choice or baking spray and set aside. In a medium sized bowl, whisk together all of the dry ingredients: flour(s), flax meal(for gf version), baking powder & soda, salt, and spices. Set aside. In a large bowl, beat the softened butter/oil together with the coconut sugar and maple syrup until creamy. Blend in pumpkin purée and vanilla. Slowly mix flour mixture into butter/sugar mixture, just until combined. Dough should be thick. Scoop dough by heaping tablespoons onto prepared baking sheets leaving a few inches in between each mound of dough. The cookies pretty much bake the way they go in, so if you want them "pretty" use dampened fingers to shape the dough into rounded mounds. Bake at 350º F for 12-14 minutes, or until the edges of the cookies are fully cooked. Remove from the oven and let cool. Transfer to wire racks to let cool completely. To prepare the glaze: Place coconut butter, maple syrup, and coconut oil into a small saucepan (or microwavable bowl) and cook over low heat just until the coconut butter and oil melt. Remove from the heat and add just enough milk to thin to a glaze. Drizzle the glaze over the tops of the cooled cookies and serve. You can use a plastic baggie (or piping bag) with a small slit cut in the corner for a cleaner drizzle. Makes about 1½ dozen cookies. Alternative cream cheese glaze: If you don't care for the taste of coconut, you can try this glaze. Whisk together cream cheese and maple syrup until creamy. Mix in milk, a little at a time, until it's thin enough to drizzle. You can use a plastic baggie (or piping bag) with a small slit cut in the corner for a cleaner drizzle. Makes about 1½ dozen cookies. *Oat flour can be made by grinding gluten-free rolled oats in a food-processor or coffee grinder until fine. **If you don't have ⅛ teaspoon, just measure using half of the ¼ teaspoon.